Now is the Time to #ShareShooting! e-universe. Not a new idea by any means, but a new spark. Now, I don’t usually get political or preachy, so I’ll make this short and sweet. I’m thinking 2016 is a great year to #ShareShooting and help others #LearnToShoot! Now, it’s not because I instruct on a part-time basis. But more because this is a critical time in our country, and this year could be life-changing for all of us; And for our children’s future; And their children. I’m sure you understand. #ShareShooting and help others #LearnToShoot. Why should we do this, you ask? It’s so extremely important that the first impression of / exposure to shooting is a positive, safe and informative experience. And you can be the start of, and/or a part of this movement! As you already know, there are so many benefits of learning how to safely, accurately and properly shoot a firearm. 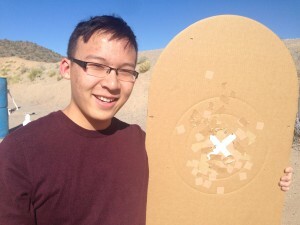 Once a newbie has learned gun safety and the basic, proper techniques, shooting can become a life-long skill / hobby that is fun, challenging, rewarding, relevant, practical and empowering. And the newbie could become a life-long gun supporter. It’s also an IMPORTANT election year. Our 1st and 2nd amendments are being challenged across the country, on what seems a daily basis; New executive actions threaten our rights as law-abiding gun owners. Seems the President is more concerned about restricting us than he is about doing anything, something, to combat threats to our country and citizens. Reality check – And unfortunately, as the world only becomes more dangerous, our own personal safety and security is our own personal responsibility. Another priceless benefit of knowing how to shoot. Each and every new, excited, safe, properly-trained, pro-shooting, pro-gun person in America can potentially help to get our country back in line. Furthering firearm safety, training, marksmanship and education is a win-win for all legal, responsible gun owners. Let’s all get involved. The time has come. So make a pledge to expose as many others as you can to shooting – from now, 2016, to infinity and beyond. I’ve already started. Took my neighbor to the range last Sunday. That’s his photo at the top. And guess what? He LOVED it! One down … Many millions to go.